PartyLite Candles – This is a candle company where you can start your business at no cost by having a party at your home with at least $350 in sales. If you do not hold a party or generate $350 in sales, the kit costs $99. Fuller Brush – You sell Fuller brand cooking and cleaning supplies. While some of the start up options require you pay a fee, they do have a $5 information kit, too. Avon – Avon is one of the oldest, most reputable companies around. You are primarily selling beauty products, but they have lots of other items, too. It is super cheap to join — just $25. You also get your own free website that you can refer people to for online sales. Earn between 20 and 40 percent commission on sales. Kat's Coffees – This one is just $5 to start. You are selling coffee, tea, and condiments. Heritage Makers – Online publishing and digital scrapbooking. They have a $25 consultant e-welcome kit. Note that this kit does not contain products. The kits that contain products are far more expensive. Noevir – Selling beauty/hair care products. Get started for $25. Earn 30 percent commission on sales. Bella Branch – They have an affiliate program that is free where you can get 25 percent commission for referring people to buy their jewelry. They give you your own personalized website to use for sales which costs $32.90 for the first month, then $12.95 for each month after that. 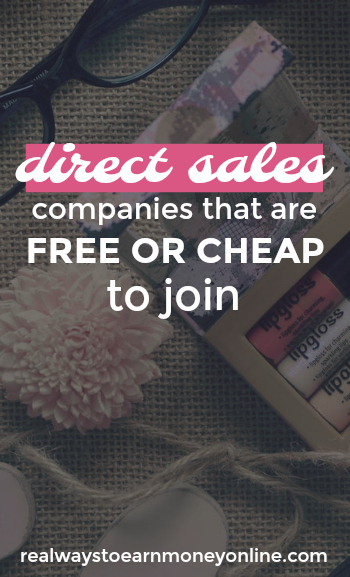 You can find a ton more opportunities on this big list of direct sales companies. Please keep in mind I cannot personally vouch for any of these companies. You will need to read ALL the fine print before signing up to be a consultant. There could always be “hidden” fees, so make sure you are fully aware of the all the details before you pay anything and register. P.S. – If you want to start a direct sales business, and you can afford to spend MORE than $50 to start, you'll be excited to know that Stella & Dot (a VERY high-quality jewelry company) is offering a sign-up bonus for new stylists now through 4/30/18. all for $199! Go here to read more about the opportunity.